Here is the layout of the Geneious window. The Toolbar is found at the top of the Geneious window, and contains a variety of buttons including Back, Forward, Tree, Support and so on. 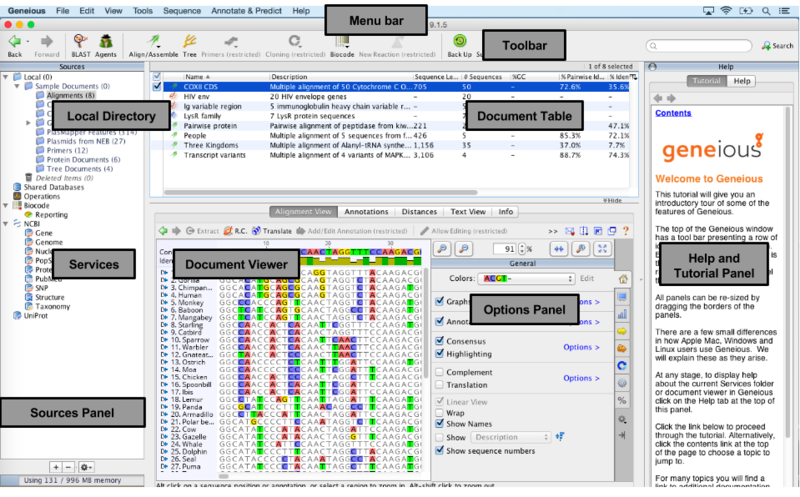 The Geneious window is further divided into a number of panels including the Document Table, Document Viewer, Options Panel. The size of each panel can be adjusted by clicking on the border and dragging to the desired size. On the right-hand side is the Help and Tutorial Panel, where you can read a number of tutorials and also search for help in other topics. On the left-hand side is the Sources Panel which includes the Local Directory and list of Services. The Local Directory is where you permanently store your documents such as primers, raw traces, contigs, alignments, trees etc. Plugins are downloadable modules that can add new functionality to the program. Click on “Tools” in the Menu bar then select “Plugins” from the dropdown menu. A new window will open and the “Plugins and Features” tab contains information on the available and installed plugins. One way to install a plugin is to click on the “Install” button for the relevant plugin in the available list, or alternatively, you can download the plugin from an outside source and then click on “Install plugin from a gplugin file”. Within this window you can also uninstall installed plugins, get plugin information such as versions, check for plugin updates etc. To add a primer to your Local directory, you should first highlight the desination folder for the primer file. If you need to create a new folder in the directory, highlight the Local folder in the Sources panel, Click on “File” in the Menubar, and enter the new folder name. To create a new primer, highlight the destination folder, then in the Toolbar select “Sequence” followed by “New Sequence” from the dropdown menu. A “New Sequence” window will open. 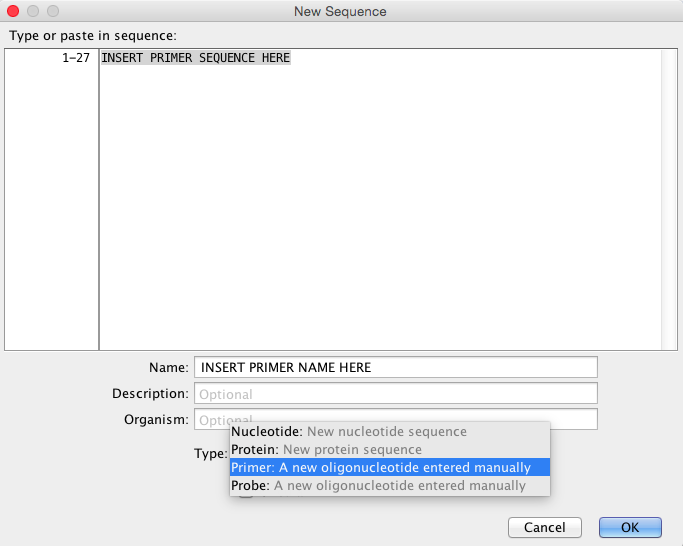 Here, you must enter the primer sequence, name and in the “Type” dropdown menu select “Primer”. Once a primer has been created, you can edit the associated information. Highlight the primer in the Document Table, and go to the “Info” tab in the Document Viewer. 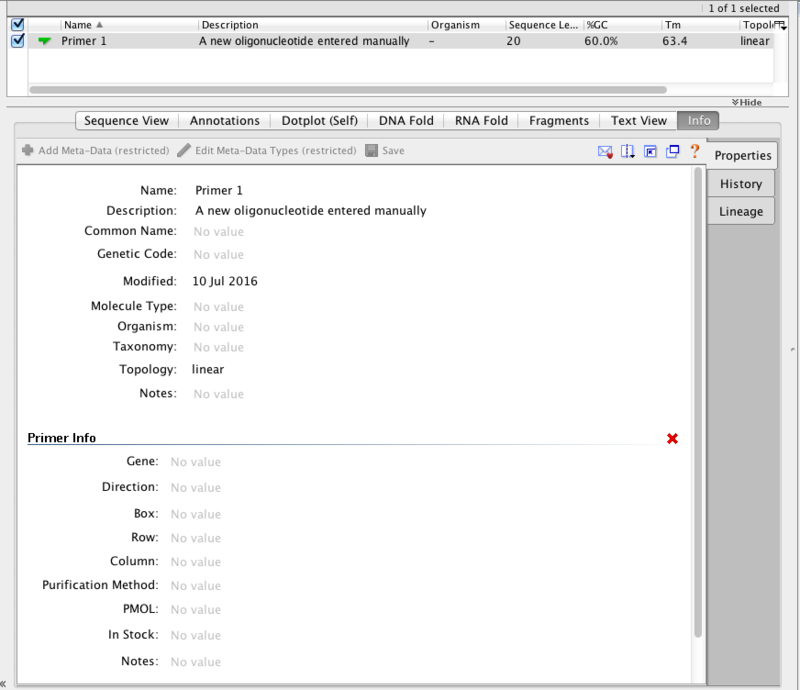 Here you can add various meta-data such as Gene, Organism, Direction etc. We recommend that you fill in as much information as possible for future reference. A very convenient tool is the ability to export and import folders of primers. To export a folder from the Local, simply select the folder, go to “File” in the Menu bar, followed by “Export” in the dropdown menu. There are multiple options for the export, however in this case, select “Export folder” and enter a name and destination for the export. There are two options for importing a folder or file into Geneious. One way is to go to “File” in the Menu bar, followed by “Import” in the dropdown menu, and then select what you are importing (folder, file etc.). You will need to select the type format followed by the location of what you want to import. Alternatively, you can move folders, files etc. into the destination folder by dragging and dropping.